First Weber Racine recently presented a check for over $2500 to Elizabeth Bloodworth, director of Teen Reach Adventure Camp. 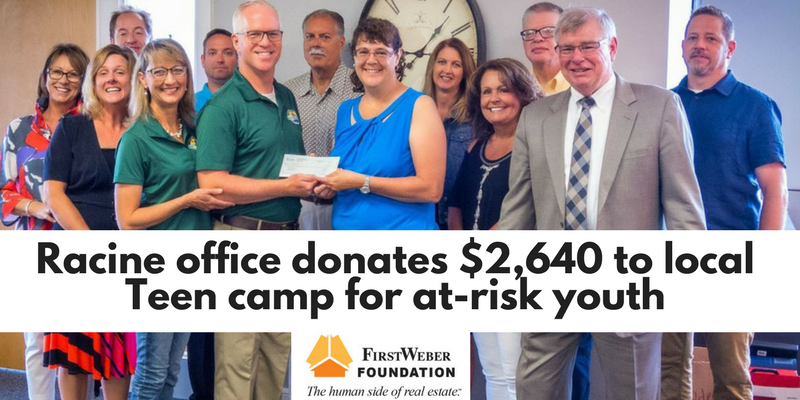 Racine agent Billee Kotten has been volunteering at the camp for the last 3 years and involved her fellow REALTORS as she recognized the ongoing financial need for the camp. TRAC is a 3 day, single gender camp experience and year-round mentoring program for at-risk Foster care youth aged 12-15 in Racine and Kenosha Counties. Campers enjoy the outdoors, learn trust and their individual potential. Campers are given inspiration and help with achieving attainable goals. The Racine agents raised $1,320 and with the First Weber Foundation’s matching gift program they were able to donate $2,640. Great job of helping out in your communities! Welcome to the First Weber Team! We make getting your Wisconsin real estate license easy.